Even though it was almost 90’F in Dallas yesterday, I’m starting to get so excited about autumn! I’ve been collecting sweater knits for weeks now, and daydreaming about all of the great sweaters I want to make for this season. Sweaters, leggings, and booties are my go-to uniform this time of the year, and I love incorporating shades of crimson and turquoise in with the warm neutrals of autumn. I’ve brought quite a few of these elements into the outfit for today’s post! I’m very excited to share this one with you guys, especially because this pattern is on SALE today! 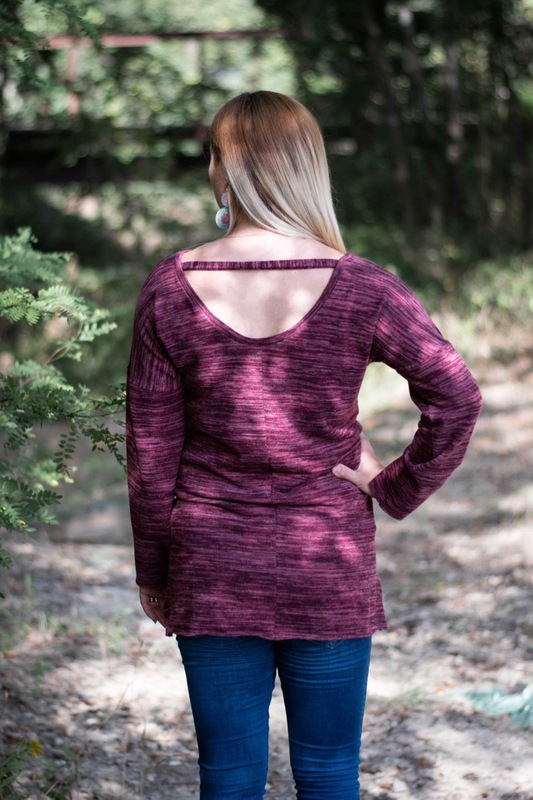 Two of my favorite features in a top are a good V-Neck, and a back detail. This pattern ticked both of these boxes, while also being a slightly oversized and comfy sweater, so as soon as I saw it, I was on board. I had recently picked up a bunch of sweater knits from So Sew English Fabrics (my go-to for knit fabrics lately!) and I had plans laid out for all of them except this one. 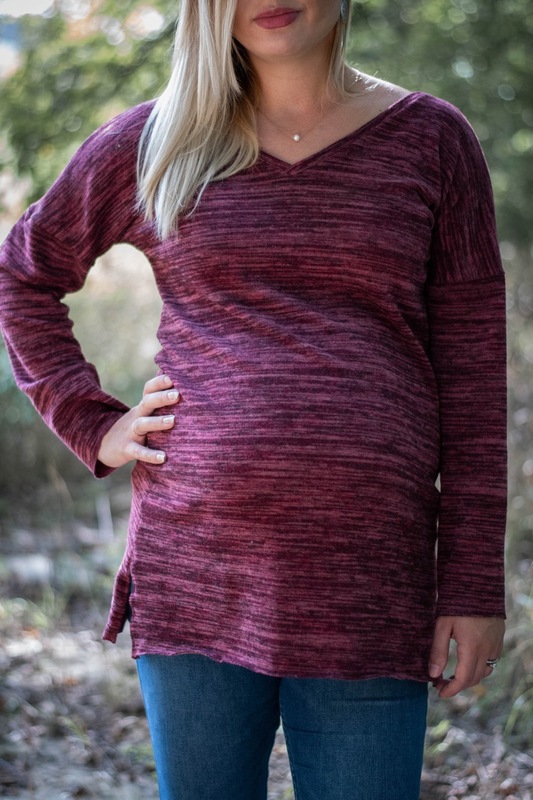 As soon as I found out that the Fireside Top pattern was going to be included in the Ellie & Mac “Wacky Wednesday” promotion, I decided that this would be the perfect pairing and decided to expedite my plans for this sweater. I printed and trimmed the pattern on Monday evening, and cut the fabric out later that evening before heading in to work. The next day, I was able to sew this sweater up in just about an hour and a half! 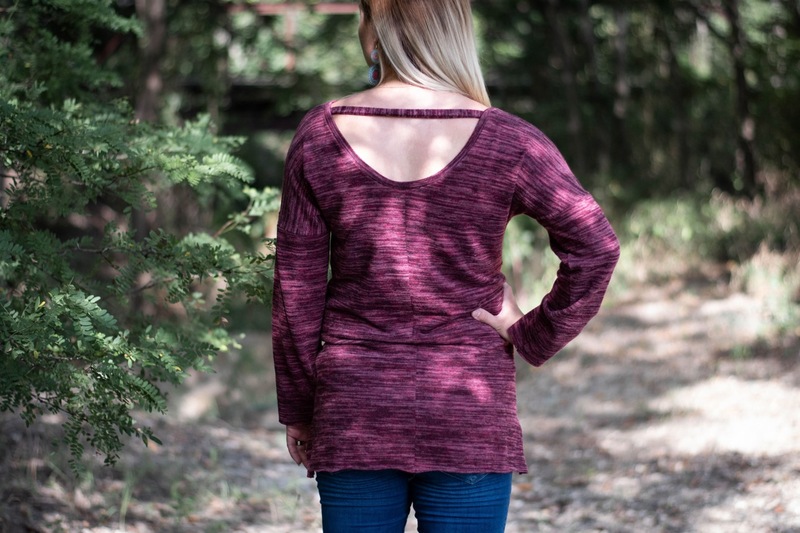 The construction of this pattern comes together rather easily, and the instructions offer helpful little details – such as basting your neck band in place at the V – that help ensure that you’re going to come out with a sweater that you’re happy with. I did utilize my serger for most of the major seams of this sweater, in part because a serged seam makes me feel like my construction is more secure, and partially for the speed of it! I used a stretch stitch / lightning bolt for the side seams construction so that I would be able to back stitch and allow for the split seam detail. I chose to leave my sleeves and hem unfinished, which I love the look of right now. I know that this is not the most secure option, but this sweater knit showed no signs of fraying after pre-washing and I have always loved unfinished hem details on sweaters! On the bright side, if I ever change my mind, I can always finish them up later. 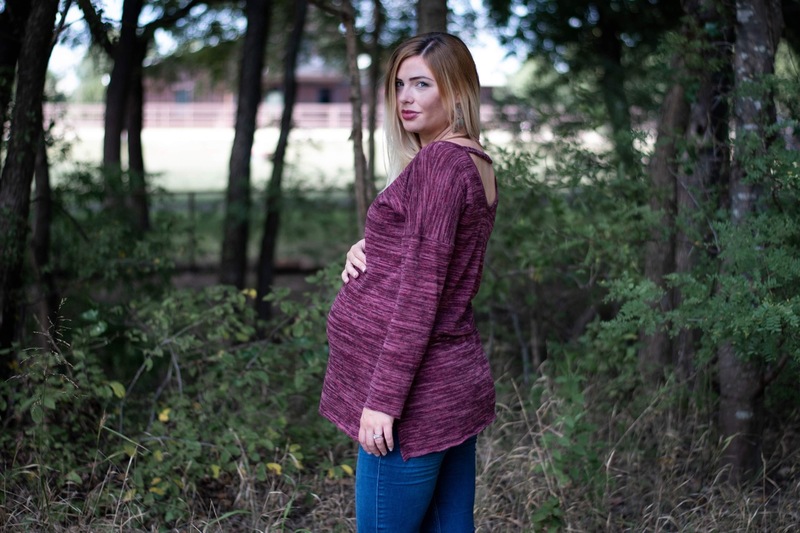 Despite being 36 weeks pregnant, I went ahead and went off of my pre-pregnancy measurements and chose to sew up a size small in this sweater. I looked through many of the (awesome!) inspiration photos on the pattern page, and recognized that this pattern is intended to be a bit oversized, so I figured that even without making any modifications, I would still have plenty of belly room. I was right! I actually felt like this size may even be a bit bigger than I would like, so I would personally recommend sizing down a size – I really think even a size smaller would have accommodated my big belly just fine, and would fit a little better around my bust and arms! Next go round, I will probably go ahead and switch myself over to an XS. If you think you might need this pattern in your wardrobe as the weather cools down, today is your day! 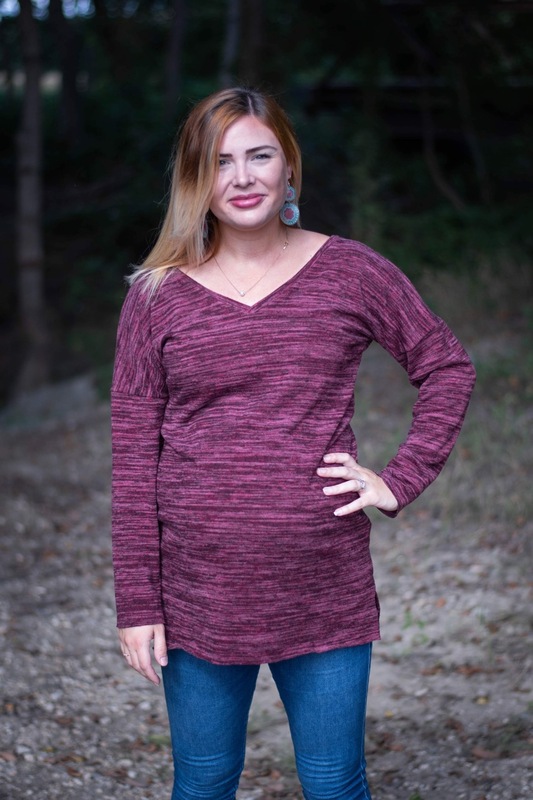 Ellie & Mac Patterns do an awesome weekly promotion, offering a handful of patterns for only $1 each – and today the Fireside Top is included! I included my affiliate link below for anyone interested! As for key ingredients for making this pattern come to life, you don’t need much more than the absolute basics! If you are thinking of sewing this pattern up entirely on a sewing machine, you can absolutely do so as long as you use some ballpoint needles and a stretch or zigzag stitch! However, I also included a link to the serger that I use on almost all of my knit makes – this serger is VERY affordable as far as sergers go, and I have not encountered anything that it can’t do yet! I prefer to use a three thread narrow overlocking stitch for all of my knit projects. Lastly, a loop turner – I turned that back strap in 3 seconds flat! What is everyone else looking forward to adding to your me-made autumn wardrobe now that the seasons are thinking about changing? I’m looking forward to more sweaters – more of these, and hopefully a Kyoto or Tabor or two, along with a few more cool colored leggings! 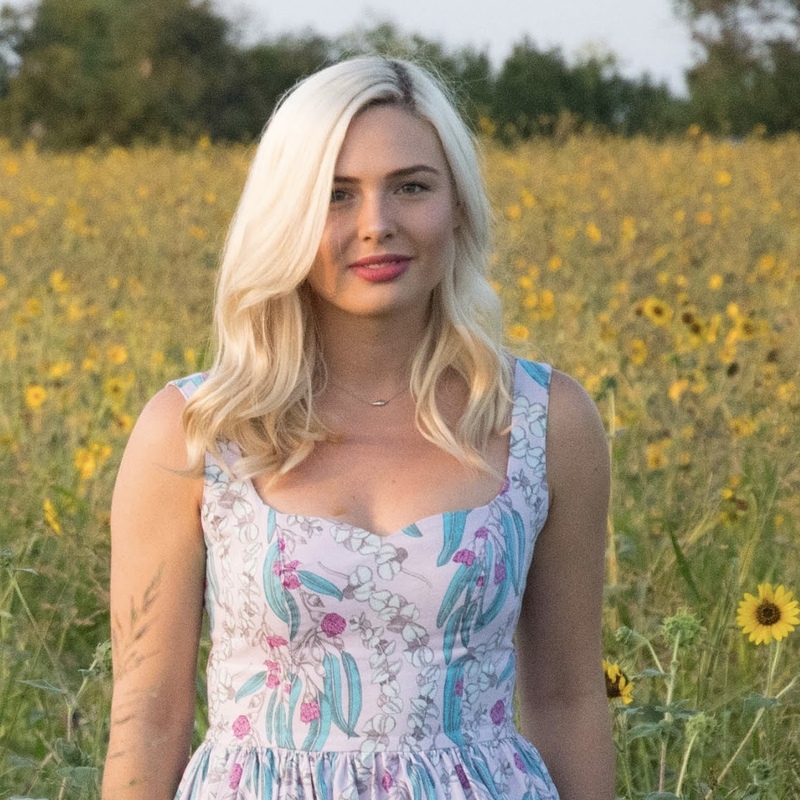 Though the fabric used in this post was generously provided to me by So Sew English Fabrics, and the pattern by Ellie & Mac Patterns, all opinions expressed are my own, as always!